The U.S. Surgeon General has declared nicotine a drug and nicotine addiction as tough to beat as heroin or cocaine. For a smoker, the first step toward breaking this addiction is to recognize the problem and decided to do something about it. Congratulations for taking this step. Conquer Nicotine Addiction the Natural Way: By Reducing Your Dependency. Gums and patches don't reduce your dependency on nicotine. They just allow your body to get it from another source. 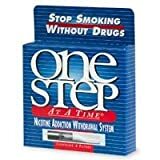 One Step at a Time lowers your nicotine dependency in gradual increments. It offers a proven way to conquer your addiction. Without patches. Without gums. Without doctors. Without costly reconditioning programs. The system consists of four filters, each to be used 7 to 14 days. The first filter eliminates up to 25% of nicotine and tars; the second up to 50%; the third up to 70%. By the fourth filter you will be eliminating up to 90% of nicotine and tars. So, when you finally put that pack of cigarettes down for the last time, you can walk away with virtually none of the physical pains, mood swings and craving that have always made the cigarette habit so hard to break. Heartburn, also known as acid indigestion, is a common condition that affects millions of people. It can last for a few minutes or a few hours, and is described as a burning or painful feeling in the chest. It often strikes after a meal or at night when lying down. The proprietary herbal formulation in ZERO NICOTINE Patch contains ingredients that act as natural substitutes for nicotine; thereby satisfying the body's craving for this substance, without all the negative side effects of patches containing the actual drug, nicotine. The all-natural ingredients will make you crave fewer cigarettes each day. This gradual process allows you to quit with no withdrawal symptoms and requires less willpower and effort on your part. After analyzing many applicable studies and products currently sold on the market, we have developed a revolutionary formula, found in ZERO NICOTINE Patch, which offers smoking cessation in a very short period. Withdrawal symptoms will be milder due to the all-natural nicotine substitute, which helps you shake the nicotine habit gradually, with less physical and emotional stress. Furthermore, to help you through the process, ZERO NICOTINE's herbal formulation helps decrease the anxiety and depression that affect most people who are trying to quit smoking. The nicotine content in your system will gradually decrease as you continue to wear the patch. To help you speed up this important process, ZERO NICOTINE contains ingredients with distinctive antioxidant properties, to detoxify your body and eliminate the nicotine stored in your cells. Most of the harmful effects of smoking will start to disappear once you stop smoking completely. The patch application method allows the active ingredients to penetrate the skin and reach the bloodstream faster and more conveniently than any other method. Other methods, such as pills or lozenges, must be taken several times per day, since they lose many of their active ingredients as they are processed by stomach acid, minimizing their effectiveness. The revolutionary patch system eliminates the need to remember to take pills. Simply apply a new ZERO NICOTINE Patch every three days. It's that easy! Absonutrix Anti Smoking Nicotine Free Patches is here to help you achieve your goal. The natural ingredient in this patch helps you to successfully quit smoking without feeling any side effects or withdrawal symptoms. Absonutrix Anti-Smoking Nicotine free Patches - 1 month supply Do you want to kick the habit of smoking? Absonutrix Anit-smoking Nicotine free patch is here to help you achieve your goal. The natural ingredient in this patch helps you to successfully quit smoking without feeling any side effects or withdrawal symptoms. Absonutrix Anti-smoking patch is 100% herbal and safe. Ingredients Alfalfa Echinacea Licorice root Golu kola Hops Skullcap Oats Peppermint Gingerroot Gentian Myrrh Safflower Passion flower Bayberry Eucalyptus Vitamin E How to use Anti-smoking patch -Choose a clean, dry, hairless area on your upper body to apply the patch -The package contains a pouch of 5 cards, each with 6 patched attached. Peel each day and apply to upper arm, shoulder or back area with adhesive area down. The leave the patch in place for 24 hours -Drink at least 8 ounces size glasses of water each day. This will help flush out toxins from your body and replace essential fluids -Combine the original stop smoking patch with a healthy diet and regular exercise to achieve maximum benefits -It is recommended that you continue with the Absonutrix Anti Smoking Nicotine Free Patches for at least 120 days or until you reach your goals. The natural ingredient in this patch helps you to successfully quit smoking without feeling any side effects or withdrawal symptoms. Absonutrix Anti-smoking patch is 100% herbal and safe.